You do remember the Elementary and Secondary Education Act is the largest education legislation in the U.S., right? It was signed into law on April 11, 1965 by President Lyndon B. Johnson. During the first term of President George W. Bush's administration, it was reauthorized (2001) and referred to as No Child Left Behind. As with all federal laws that have financial implications, it was to be reauthorized every 5 years. It is 2013 and a bit overdue. However, starting in 2002, CASE began looking at the reauthorization of ESEA because there were some significant issues we believed needed to be addressed. We solicited a great amount of input from our membership and our Legislative and Policy Committee along with our legislative consultant worked hard in putting those concerns into a well worded formal document. 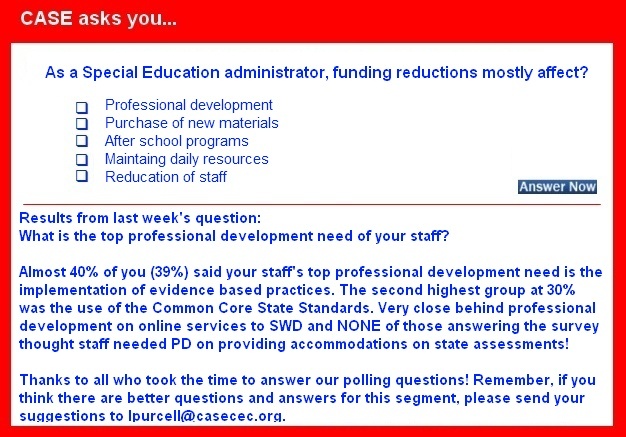 Have you read CASE's ESEA Reauthorization Recommendations lately? Our Policy and Legislative committee under the very capable leadership of Christina Lebo (VA) even revised the document several times since the reauthorization did not happen after 5 years or even 10 years! The document still speaks volumes and has been used by Senate HELP staff in wording several of the various drafts. There are again rumblings that Congress will once again try to Reauthorize ESEA this summer — perhaps about the time CASE will be there for our 11th Annual Educational Legislative Leadership Summit! You may also remember another important piece of federal legislation, the Individuals with Disability Act which was originally signed into law by President Ford on November 29, 1075 and was referred to as the Education of All Handicapped Children Act or PL 94-142. The last reauthorization of IDEA was in 2004 and there were several items that did not make it into the reauthorization of ESEA that were put into IDEA — most notably, wording that now dictates most of what is done with RTI. Once again our Policy and Legislative committee has asked for and received input concerning IDEA but now, even though we do not have any projections on when the reauthorization will occur, CASE needs to be proactive and develop a formal written paper on what Special Education Administrators want to occur with the next reauthorization. CASE must be proactive. To this end, you will be receiving a link to a short but thorough survey to help the committee, again under the capable leadership of Christina Lebo, discern what our members think about IDEA and the changes that need to occur. We know how busy you are and especially right now but please take the survey as soon as you receive the survey link towards the end of the week. In the U.S., almost every regulation we have is tied to this law. We must take an active role in this reauthorization as we have in the past. Help us be your voice but answering the survey when it arrives! In recognition of Teacher Appreciation Week, 20 CEC members had the unique opportunity to sit down for a conversation at the U.S. Department of Education to discuss many of the most pressing issues in education, including new teacher evaluation systems and the implementation of college and career ready standards. Did you know that policymakers in Washington are thinking about cutting funds for IDEA's Personnel Preparation Program, a leading source of financial assistance for future special education, local/state leaders, researchers and related service personnel? Since 2009, CEC has supported federal legislation, which is closely aligned with our Policy on Restraint and Seclusion, and would restrict the use of restraint and seclusion in public schools, except in cases of emergency. Unfortunately, although introduced in the House and Senate for the last 2 Congresses, this legislation has never passed. Join the U.S. Department of Education's Office of Special Education and Rehabilitative Services, along with the U.S. Departments of Labor, Health and Human Services, and the Social Security Administration for a free, public, online dialogue to discuss the impact of federal regulation and legislation on successful transition from school to work of youth with disabilities. The Council for the Accreditation of Educator Preparation is seeking volunteers to serve on its first governance bodies. This is an opportunity to help shape accrediting standards for educator preparation through a new accrediting body. The application process will be open to self-recommendation, as well as to those recommended by CAEP members or affiliate organizations. Volunteers will be solicited from various sectors such as P-12 practitioners, policymakers, postsecondary faculty and administrators, employers, parents, school board members, and the public at-large for positions on the following committees: International, Nominating, Research, Standards, and State Partnerships and Content Areas Committees. The brains of males and females with dyslexia differ significantly, which suggests the learning disability needs to be treated separately in each gender, a new study has found. The past three years have seen a sea change in the use of technology in special education. A small change tucked inside a government spending bill may have big implications for special education. The Common Core State Standards ask students to perform with higher levels of cognition and application, and brain training and specific teaching methods can help students succeed with these new standards, experts say. According to Margaret Glick, a neuroscience expert and educational consultant at the International Center for Leadership in Education, the Common Core State Standards and the accompanying assessments will cognitively require more than past standards. Diana Sticker, a contributor for the National Center for Learning Disabilities, writes: "We loved our drive to school each morning. It gave us time to chat about the upcoming day's events. But in 4th grade our morning routine changed. My daughter became anxious and teary eyed on the way to school. She frequently had stomachaches. Some days she complained about being overwhelmed in writing class. Many times she refused to go to school. This was unusual. She was a bright, hardworking, creative and enthusiastic student. But unknown to me and her teachers, she was struggling to keep up. Over time I started to recognize the root of the problem: dyslexia." Exposure to certain heavy metals during the early stages of growth may interfere with a child's ability to perform at school later. Explaining this point, researchers found that children with high levels of lead in their blood have reduced reading readiness at kindergarten. To analyze the link, Pat McLaine and team looked at 3,406 kindergarten children in Providence, R.I. Looking for similar articles? Search here, keyword READING SKILLS. A new report that reviewed years of research says that it is hard to accurately monitor levels of bullying in schools because there is still no consensus on exactly what it is and that educators and scholars "should not limit themselves to the traditional definition" as they seek ways to combat it. The report, called "Prevention of Bullying in Schools, Colleges and Universities" and just released by the American Educational Research Association at its 2013 meeting in San Francisco, is the work of a blue-ribbon task force that was charged with finding short- and long-term recommendations for institutions to address bullying of young people. Until recently, U.S. Sen. Tom Harkin, D-Iowa, the chairman of the Senate education committee, and Tennessee Sen. Lamar Alexander, the panel's top Republican, were in talks to see if there was any chance of getting a bipartisan bill to reauthorize the long-stalled No Child Left Behind Act together in this Congress. But now it's looking like the two lawmakers were unable to resolve fundamental disagreements, making an already very tough reauthorization process that much harder. In an effort to identify better strategies to help young people with disabilities transition from school to work, a handful of federal agencies are seeking public input. Recently, the U.S. Departments of Labor, Education and Health and Human Services as well as the Social Security Administration are kicking off a two-week so-called online dialogue. The agencies are asking policymakers, educators, service providers, families and youth with disabilities themselves to share their thoughts through a Web interface on how to improve transition outcomes. Slowly but surely, a growing number of states are eyeing policies to select academically stronger individuals for their teaching programs as one avenue to improve the quality of new teachers. Underneath the attention such plans are attracting, though, run deep-seated fears about their potential consequences — particularly whether they will result in a K-12 workforce with fewer black and Latino teachers. On nearly all the measures states are considering, from GPAs to licensure-test scores, minority candidates tend to have weaker scores than their white counterparts. Looking for a clearer picture of how poor, middle-class and wealthy students perform in U.S. schools, the Obama administration wants to redefine how it calculates children's socioeconomic status. In a new white paper, just released, the U.S. Department of Education proposes classifying students by more than just their parents' income or education levels. It explains the federal government should be able to tie test scores to a host of indicators, including: whether parents own or rent their home, how many times a family has moved in the past year and whether anyone in their household gets medical assistance. In statehouses and cities across the country, battles are raging over the direction of education policy — from the standards that will shape what students learn to how test results will be used to judge a teacher's performance. Students and teachers, in passive resistance, are refusing to take and give standardized tests. Protesters have marched to the White House over what they see as the privatization of the nation's schools. Professional and citizen lobbyists are packing hearings in state capitols to argue that the federal government is trying to dictate curricula through the use of common standards. As part of an effort to improve the quality of educational research and make it less balkanized, the National Science Foundation and the Institute of Education Sciences have introduced a common set of evidence standards for federally funded work. The criteria, rolled out at the American Educational Research Association's annual meeting, will guide all new research at the IES, the U.S. Department of Education's main research agency, and all NSF research in science, technology, engineering and mathematics education. The brains of males and females with dyslexia differ significantly, which suggests the learning disability needs to be treated separately in each gender, a new study has found. Researchers used MRIs to scan the brains of 118 men, women, boys and girls with and without dyslexia, which impairs a person's ability to read. Compared to people without dyslexia, males with dyslexia had less gray matter in areas of the brain that process language, while females with dyslexia had less gray matter in areas involved in sensory and motor processing. High stakes testing season is upon us. One purpose of testing is to assess what students know and to guide them to be ready for their future. Students with disabilities are provided support through individualized testing accommodations that ensure that their disability does not interfere with their ability to access the information and to express what they know. The idea is to make the general education curriculum and assessment procedures accessible to all students. Forget tiny iPads — the classrooms of the future might turn entire tables into interactive touchscreens. Given that many children can sit rapturously before a glowing touchscreen for hours, such gadgets seem like a natural for the classroom. But as with any new teaching technology, it's important to make sure it actually helps students learn and teachers teach before getting caught up in its "cool" factor. Young adults with autism are often left out socially, with new research finding they are less likely to receive phone calls and invites from friends than even those with other types of developmental disabilities. In a study looking at the experiences of young people who received special education services, researchers found that those on the spectrum are facing a particularly rocky transition to adulthood socially. New federal guidelines could result in noticeable changes to the school day for local students with learning disabilities. Wisconsin Rapids School Board members will consider a variety of changes during their monthly meeting, including adding periods during the school day at the junior high and high schools and purchasing intervention tools to help the district comply with new regulations. In most U.S. schools, the school day and year are the same length today as 100 years ago — 6 ½ hours, 180 days. Expectations for what schools must crowd into that time have risen sharply, though. Concerns that American workers need better preparation to keep up with global competition have increased school hours spent on math and English language arts, especially since the advent of the federal No Child Left Behind Act in 2002.